It's so exciting when you save up that 5% Down Payment and you are finally able to afford a house. The wind is quickly let out of the Sail though as soon as you see the Insurance cost required to get your mortgage....it can be as high as 4.90% for some folks! Here in the Great White North, we have 3 Mortgage Insurance providers. They are CMHC, Genworth Financial, and Canada Guaranty. They are nearly identicle with a few wavering product differences, but all in all they do the same thing...they protect your lenders money. But what is it? Do you need it? How do I pay for it? Is it negotiable? What is it? Mortgage Insurance is also referred to as "Mortgage Default Insurance". It helps Canadians buy a home sooner and with a lower down payment...as low as 5% for qualified borrowers. Mortgage Insurance is NOT Life Insurance. Life Insurance is what you need in case you Die. That's an entirely different animal - but it's optional and is discussed with clients case by case as it pertains to them. Do you need it? If you have a down payment of less than 20%...then you need it. If you have a down payment of 20% or larger...you may not need it...even if you have 25% to put down...you still may need it. How do I pay for it? Good News - the lender adds the insurance cost to your mortgage and they pay it directly to the Mortgage Insurer. Is it negotiable? No. Mortgage Insurance is non-negotiable. It is set up on a sliding scale based on the size of your down payment and/or the product you require. Above is an image that shows the Mortgage Insurance Premiums for standard Purchases for the general public. For example...let's say you buy a house for $100,000.00 and you have $5,000.00 for a down payment. That would put you in the 3.15% Mortgage Insurance Premium box. 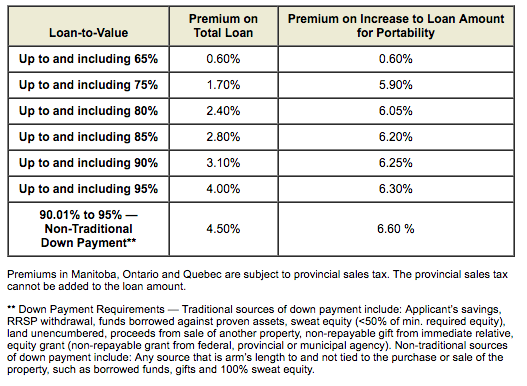 The other figures you see there apply to refinances...typically refinances are restricted toa maximum of 80% LTV...so the premium there, if the lender chooses to insure - would again be 3.15%. In most cases this premium is absorbed by the lender. In other cases it is not. Fun fact about Energy Efficient Homes...you can get up to 10% of your Mortgage Insurance Premium back in your pocket if your home qualifies!! Another Fun fact...our Mortgage Calculator already takes in to account your potential Mortgage Insurance Premium! Hurry - go check it out. We're pretty proud of it!